What about mouse, like aim direction around character and lmb/rmb to shoot/jump? Anyway I'm really glad that I met your devlog, mechanics looks unusual and interesting to play, and art is rad. Thanks man! And yep, pointing and clicking with the mouse IS something we didn't try yet. We will try that! We did another art overhaul. 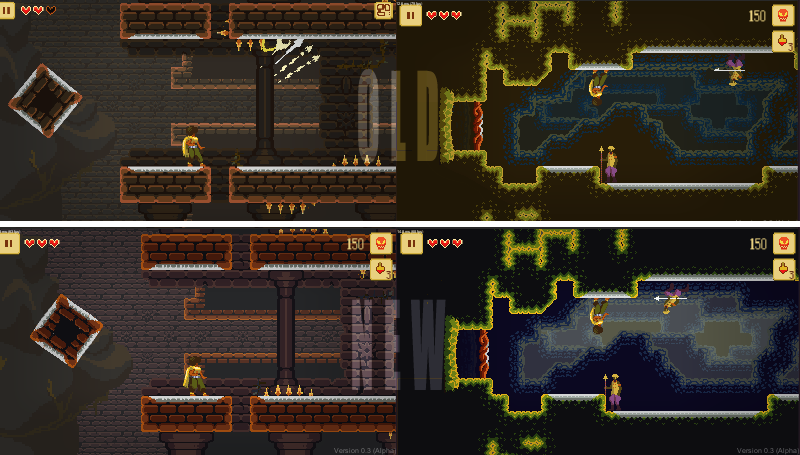 In the beginning of the project, we decided on limiting ourselves with a color palette so the pixel art feels more coherent and we felt that’s what most people do. Also, we get to use creativity once the limit barred us which would lead to awesome character design. While that is true, it was our first time making a pallette, so I can say this: it totally sucked. Columns would not have consistence in the luminescence, and it was too saturated at times and too unsaturated at other times. There’s actually two pallettes. We decided to make one for the objects and grounds, and another one for props and backgrounds, to actually help us make those stand out. Well, they don’t have any difference at all, so enemies would constantly merge into the background. It was a mess. 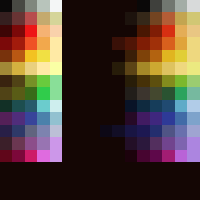 Also, we get a more bizarre, oniric set of colors that does match more with the tone we want to achieve. We are VERY happy with this transition. A little bit too bad we did a trailer before this transition, but still, I’m really glad with the trailer and the reception it made. Oh and a disclaimer: we still have to update the enemies and Dandara herself with the new palette. Which might not even be ready yet. I just wanted to share the progress with you guys. On most recent news, we're now finalists in the Best Brazilian Game category of BIG Festival in São Paulo! We're thrilled, this was some sensational news! So, while we've been working on repainting all the scenes, and in some juicing stuff that always bothered us, here's some of the results. New colors everywhere! The enemies now stand out way more from the background! New attack animation with new money boxes! Particles! Someone said this looked like Metroid flooring. Unintentional homage. New death animation for this guy. Even more exploring in the city. Yeah it's super fast: sometimes I hate my capture programs. We added the possibility of removing the parallax background. The game won't look as good if you do remove it, but it will be able to work on older devices. There's still some work on repainting existing enemies to do as well, and it will look even better after that! So we've returned from BIG Festival! And we learnt a good lesson I want to share with you guys: think hard about the build that's gonna be displayed to the public. In BIG, Dandara was at a mobile phone chained to the wall. It was just below a TV running the trailer of the game. People can just walk to it and play the game. They can also just stop playing, because looking around there are lots of the other finalists' games. We weren't next to the stand, it was just the games and the public. We were talking to people elsewhere. People aren't gonna start playing from the beginning. As people can leave at any time in the gameplay, the next person can start playing from the middle of the game. With no tutorial to teach them the game, they are just gonna leave it without understanding it. People don't want to keep playing too much. If you spend too much time in a tutorial level to make sure they are ready for the rest of the game, they probably aren't gonna see that rest of the game. We're not next to the players. We can't just tell them how to play the game or anything. The game has to teach and be fun by the small amount of time the player is gonna sit there. A picture tutorial could pop up in the screen after a while of no inputs, so the next player can actually start with a tutorial image. There's a button written "how to play" that when pressed make the same tutorial appear. The tutorial disappears little by little, after some inputs. Maybe. Or no picture tutorial: the game just restarts if there's no input. The elephant in the room: making a special level of the game that is self-explanatory and fast to deliver whats unique about the game. You can surely think about more solutions specific to your game. And some of the solutions are just too expensive to do. Just keep in mind that if you're gonna show the game at a festival, think about how and where it will be shown. are you are gonna be always next to the game and to the player so you can explain to them how it works? Is the game self-explanatory? What is the main language spoken in the country or region of the festival? I'm super down with the art, the fem protagonist, and the concept of Metroidvanias for mobile. I'll be following! It is warning me that this hasn't been posted in for 120 days, but I found the link in your signature in another thread, and I just love the characters and character animations, and the boss' face! Sorry to hear about the BIG Festival. How is everything going since then? It's been fine! Even as I wrote only what we did wrong on BIG, we definitely had a great time over there! And we WERE finalists, so hearing people say something positive about the game cheered us a lot and we're looking forward to spend another 8 months into the development. After BIG, we made some freelance work that took us 2 months of our time. After that, we started implementing a little bit of analytics into the game so when we beta test it, we receive some useful data instead of just direct feedback. Stuff like knowing where players are struggling and where players are done with the game. Maybe I will show you guys some results, but let's talk about that later. New mechanics! Platforms that when you shoot while in it, you do a secondary action! This one, for example, is just a rigidbody. There's these platforms that you can rotate around too! Hope we can create cool situations with them. Yeah, we did a new environment, new enemies, everything! And I am really liking the new mechanics! Yay!! I'm so happy that this project isn't dead! Hey guys ! I didn't had much time to go around here saying news, because SO MUCH STUFF IS HAPPENING. It has been slow here, I know, but the game isn't dead at all. We partnered with Raw Fury, an absolutely awesome publisher which you definitely should check out their games. They recommended us to try and make gamepads work in the game, which we did and slowly cooked out something with it. The game has the same mechanics but two completely different ways to control it now, and ended up being a pretty novel game. Still coming out for mobile, but no, no more a mobile exclusive. Those facts led the game to something awesome - Dandara is now part of the first batch of Nindies, indie games that are coming to the Nintendo Switch. We're beyond baffled! Personally, having a game on a Nintendo console is one of my childhood dreams so yeah, it has been completely awesome. So, we just jumped from being a mobile-exclusive, trying to do something good in one of the least respected platforms, directly to one of the most respected platforms ever! It's a responsibility as well - we have to do our best. Congrats! I've been hearing great things about the Switch. Maybe I'll consider getting one eventually. Super psyched to pick this up on my iPad, though. Congrats guys, getting it on the switch is an amazing accomplishment! I'm looking forward to seeing the final version! I just want to let you know that I think this is a genius way to do movement on a touch screen! I feel like it's not only properly designed for the platform but also an entire mechanic on its own. Serious props. Thanks man! We're really liking it over here! But it is gonna be fine on iPad too. Thanks man! That means a lot! We really appreciate it. Gone are those purple dudes as well. Welcome to the dog soldiers! New forest environment, complete with waterfalls! Interacting with waterfalls implemented later maybe? As much as it is heroic to be a dev duo that each guy does everything, it is really awesome to be able to focus on content and level design and leaving art worrying fully to another guy who knows what he's doing. Even as we get back to full time dev over here, it is gonna be hard to show new stuff, because we're doing content that I don't really want to spoil. I'll see what I can do. That's awesome, love seeing indie games hit major platforms. The game looks amazing. Major props guys! Devlog of Worm Slayer, an action twitch platformer in 3D! Hey! I'm the composer of Dandara, so I'm making all music and SFX as implementing too! Hope you like it and feel free to ask some question if you want to! I uploaded the first version of this music for you to listen!